Lamplughsaura is a genus of saurischian dinosaur from the Sinemurian-age (Early Jurassic) Dharmaram Formation of India, between 196 to 190 million years ago. The type species is L. dharmaramensis. 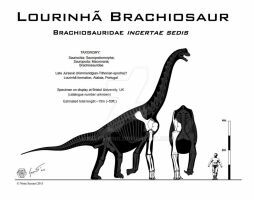 It is known from several partial skeletons of a large quadrupedal animal up to 10 meters long, and was either a basal sauropod or, less likely, a more basal sauropodomorph. It was named after Pamela Lamplugh, founder of the Indian Statistical Institute. Nice work on this one, I haven't even hear of it until now. Prosauropods and basal sauropods need more attention I think. They certainly need more attention, the stock dinosaurs are grabbing the spotlight way too much! I'm glad that you agree . Say, I like you're knowledge of dinosaurs, and you're artwork is improving too. Would you be interesting in co-running my group? I just thought I'd ask, because my currant co-founder is unreliable now a days and I wouldn't be the only one sharing dino information :/. Okay then. I'll co-run your group. Okay awesome. Ask me questions whenever, on whatever .